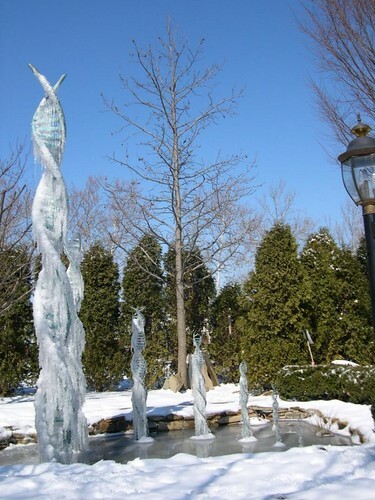 A DNA sculpture frozen like the science budget. Last year’s Science is Vital campaign was launched to defend Britain’s scientific research from cuts in the Comprehensive Spending Review that the new government undertook shortly after taking office. The campaign’s petition garnered 35000 signatures from scientists and their supporters, and several thousand of us attended a rally at the Treasury on 9st October last year. The campaign was successful, and scientific research was spared from the worst of the cuts. But the research budget was frozen and, once inflation is taken into account, that amounts to a cut of around 10%. One of the reasons scientists had to speak up before the spending review was that the contribution of scientific research to the wider economy is not as broadly appreciated as it should be. It might seem obvious that the developed world has benefitted hugely from scientific advances but evidently there is some truth to the saying “familiarity breeds contempt”. British-based scientists are being pressured to do more with less, despite the fact that the UK already punches well above its weight in terms of scientific output and influence. While we escaped the worst of the spending cuts in the CSR, I argued back in October 2010 that scientists cannot afford to wait for the axe to fall before speaking up in the future. We need to continue to get out of the lab and to engage with public debate to ensure that the scientific contribution to the economy and to our society’s well-being is not taken for granted. The Science and Technology Committee of the House of Commons is a committee of sitting MPs whose job it is to hold the government to account over science policy. They have decided to look into the impact of the spending review on research and they have asked for the views of the scientific community on the state of science funding (by 27th April). This provides scientists with a critical opportunity to have their voices heard. If scientists don’t speak up, we can hardly complain if Parliament decides that the current level of funding is sufficient. To avoid this, Science is Vital is providing a one-stop web page with all the information you need to prepare a submission for the committee. It needn’t take long, and the committee’s report will make a real difference to the way the current policy is evaluated and the way government funds science in the future – so let’s provide them with the evidence they need. Previous Previous post: Where is the hippocampus?